Oak Park, MI – There was a summit in Southfield at Lawrence Tech a couple Saturdays ago, and I needed a place to go over my notes and get some writing done. 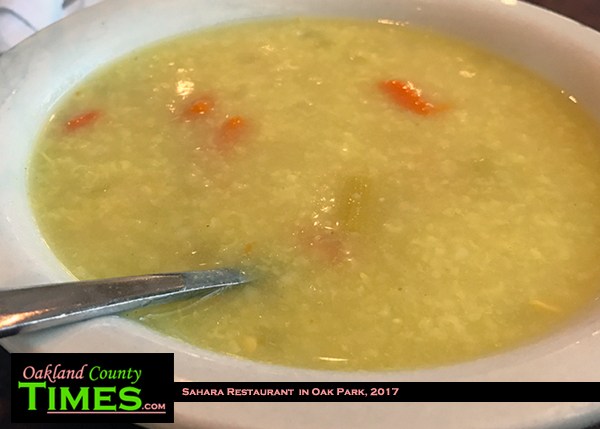 Since one of the speakers at the summit was Oak Park Police Chief Steve Cooper, I thought it might be good to find a spot in Oak Park to eat while I wrote about his presentation. 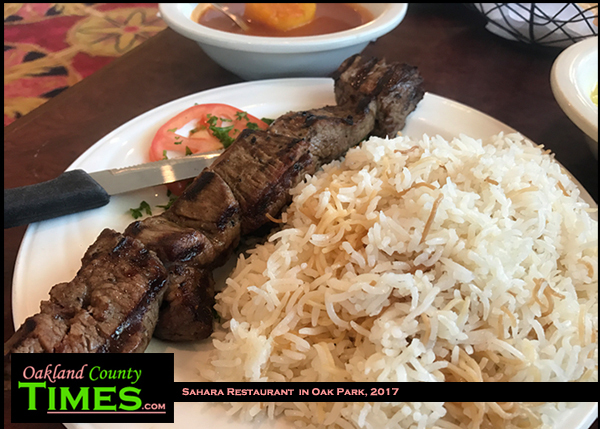 Sahara Restaurant was the perfect choice! 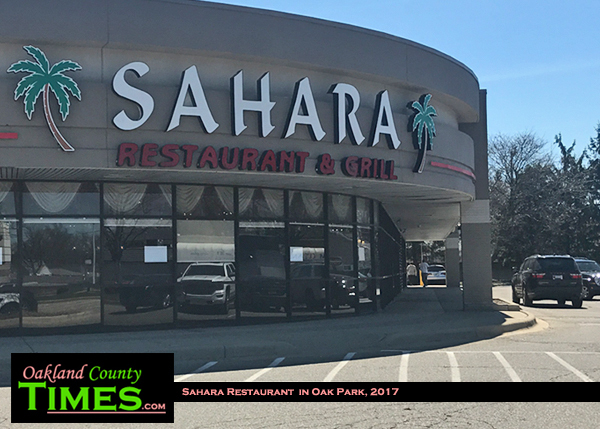 Sahara is a sponsor of Oakland County Times and also rather iconic in that their owner, Zeana Attisha was the driving force behind ending prohibition in the city. That was just a couple years ago. 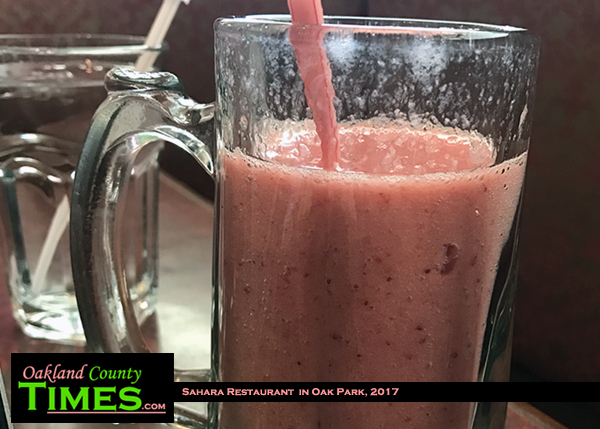 I was tempted to celebrate with a drink, but the fresh fruit smoothies caught my eye. Made with fresh strawberries and banana, it was a great choice. The food was a feast. I got a half order of Beef Kabob Tikka, which came with rice and soup (I chose lemon rice). 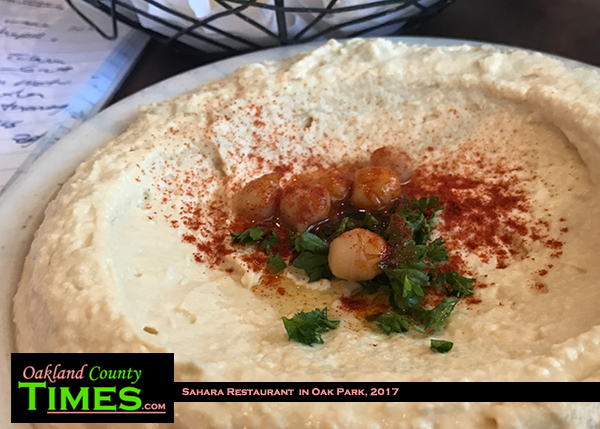 I also got hummus, which came with little pita circles that are heated in stone oven that guests can see behind the counter. I didn’t know what “tikka” meant. I’ve since learned that it just means that the meat is cut into cubes before being grilled. The beef at Sahara was so perfectly prepared that it pulled apart easily. I enjoyed filling the pita rounds with a little bit of everything – hummus, rice and beef. It also came with a spicy dipping sauce that had a rich flavor to it, but was not really my thing since I’m kind of boring food-wise. There was plenty of food to keep me grazing while I wrote my story and still had enough to take home for dinner later. Sahara is also great because their booths are huge, probably because there is so much food with nearly any order. But for me it worked because I needed space for my notebooks. 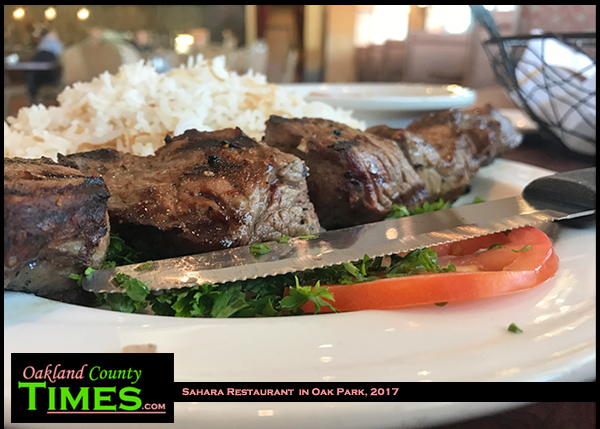 Sahara Restaurant is located at 24770 Coolidge Hwy, Oak Park, MI 48237. Learn more at http://newsahara.com/. Check out more Reporter Food columns at http://oaklandcounty115.com/category/food-blogs/.